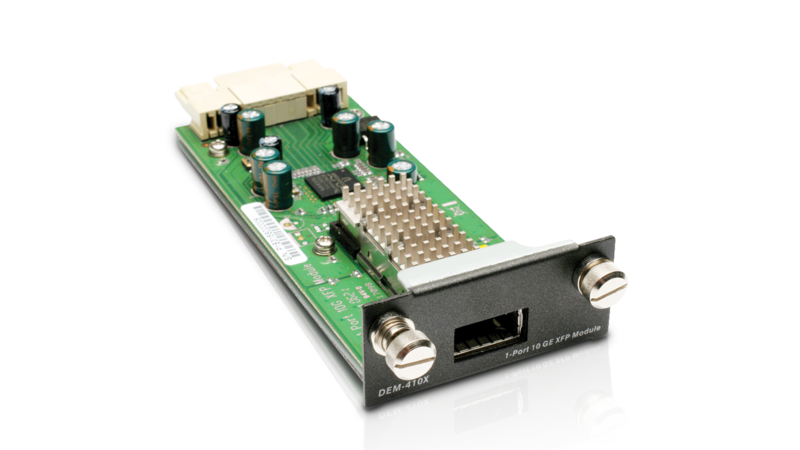 The D-Link XFP module provides high-speed 10-Gigabit connection on the secure fiber cable. It provides a single or dual XFP slots and can be slid into an open slot of a D-Link Gigabit switch. A number of 10Gigabit transceivers are available for selection for installation in the XFP slot. Data transfer is operated in the full-duplex mode at 20 Gigabits per second on either the multi-mode or single-mode fiber network cable, depending on the type of transceiver being installed. The D-Link XFP module allows flexible deployment of 10-Gigabit connection and is ideal for bandwidth-hungry applications that can meet greater cable distances and low signal interference requirements in the Local Area Network, Wide Area Network and Metropolitan Area Network. This product was phased out on: 10.6.2016.